Against the exotic rainforest, river Kwai backdrop, an elephant ride in Kanchanaburi is a truly memorable experience. The lush rainforest in Saiyok district – where the river Kwai runs through it – provides the unique jungle feel present only in this part of the world. 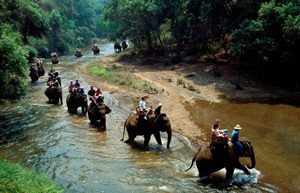 The elephants are giant yet obliging and you can choose your interaction to ride or bath the charming animals.